Give any room a dash of modern style with our Fitueyes Wall Mounted Audio/Video Console. Finished in goes-with-everything Walnut, this sleek yet functional console offers two generous storage compartments. 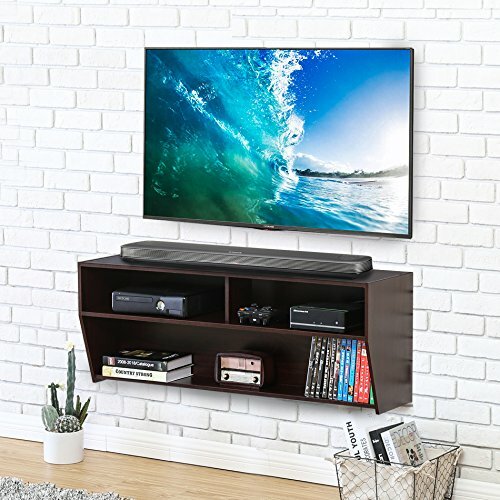 The main shelf is 48-inch length, providing ample space for your cable box, DVR or other media components.Cables are neatly concealed to give the console a professional, minimalist look. Installing this AV console at any height is simple, thanks to our innovative hanging rail mounting system. The lower shelf can place wiring board to hide the messy cable. View More In Audio-Video Shelving. If you have any questions about this product by Fitueyes, contact us by completing and submitting the form below. If you are looking for a specif part number, please include it with your message.